The Educational Bridge Project's mission is to provide a forum for collaborative American-Russian creative initiatives. The Project fosters educational and artistic exchanges and organizes two annual festivals, Days of Russian Culture in America and Days of American Culture in Russia, and in so doing creates opportunities for the participants of the academic and cultural institutions to become international ambassadors, sharing with local communities the rich musical and educational traditions of the schools, the historic cities and the cultures they represent. Young Russian and American composers in Moscow. 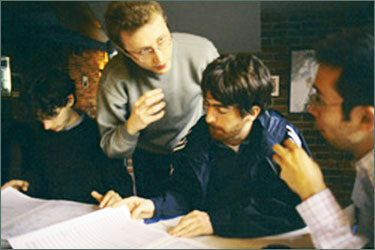 Gathering informally at a café after a master class, Boston University students (seated, from left: Matthew Van Brink, Mauricio Pauly-Maduro, and Jorge Villavicencio Grossmann) discuss their music with Russian Andrey Kulagin (photo credit: Kevin Carleton).